With the closure of the once-hip Crave sushi restaurants and nightclubs in Dearborn and Ferndale last year, it seems the days of Detroit's sushi ultra-lounges are finally behind us. 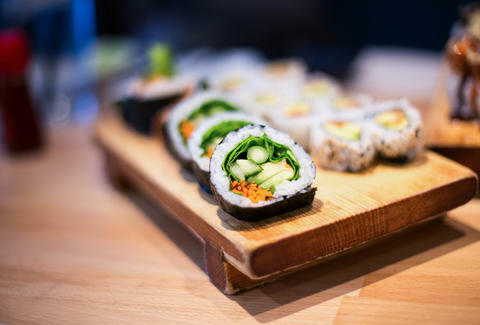 Not that we don't still love a good trendy sushi spot (Ronin in Royal Oak is still one of our favorites), but here we want to highlight some of the lesser-known, hole-in-the-wall, suburban strip mall sushi joints where rolls don't come with a dress code or cover charge. 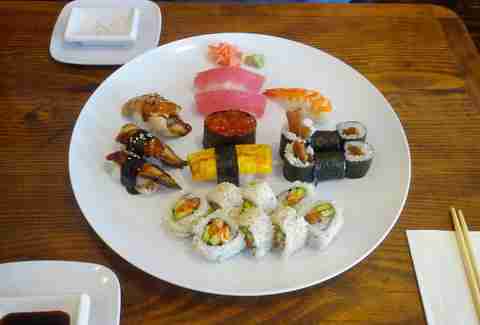 Noble Fish has, for many years, been the place to go for sushi in metro Detroit. The glorified hallway of a dining room with a handful of seats at the sushi counter has always felt more, ye gods help us all, authentic... at least when compared to the EDM clubs masquerading as sushi restaurants. Noble Fish is still at the top of the local sushi game, offering 30 different kinds of grab-and-go sushi boxes that are made fresh daily and a selection of rolls and nigiri that thankfully celebrate the simple and delicate side of sushi rather than veering towards the crazy cream-cheese-and-mayonnaise baked rolls that are smothered in avocado slices, eel sauce, hot sauce, tempura flakes, and served with lit sparklers sticking out of the top that has made sushi so popular in more mainstream joints. Ajishin is a Japanese restaurant that serves noodles -- udon, soba -- and sushi. They've got original rolls, standard rolls, special rolls, and, for those of you all in on the avocado and cream cheese, American rolls. The selection goes far beyond the usual spicy tuna and crab stick options, but for the most unique experience here opt for the kyo-chirashi -- a "scattered sushi" blend of sushi rice, baby sardines, gourd, and cooked eggs served with your choice of items like river eel, sea eel, sea urchin, and salmon roe. A relative new kid to the local sushi scene, Haru already has a dedicated following for its fish quality and other expertly-executed Japanese dishes like shabu-shabu, variety of ramen, and cold udon. It’s also already earned the Noble Fish comparison, so you know it's gotta be good. Oyaki has a little more polish than the standard suburban strip mall sushi joint, and the menu is more widely accessible -- as in, not half in Japanese, and with more "American-friendly" options for those who aren’t self-identified sushi fans. If you want things like a "White Castle Roll," "Salmon Pizza Roll," or "Heart Attack Roll," this is your place. 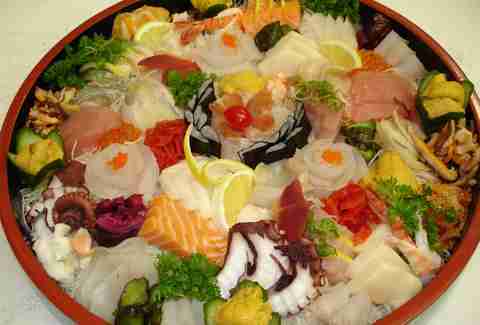 Just be sure to order enough for a sushi boat, as it's a presentation you definitely want to see. Sushi Mi, a Japanese-Korean hybrid restaurant, is the most unique option on this list, serving an extensive selection of Japanese noodles, tempura dinners, and grilled meats, as well as Korean specialties like bibimbap and bulgogi. 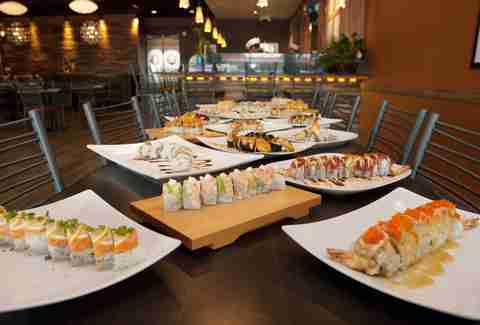 They also have a sushi bar, where regular rolls range $3-7 and none of the specialty rolls top $14. The specialty rolls here are a little bit different than at your standard sushi place -- one called "Surf 'n' Turf" includes shrimp and ribeye steak with spicy mayo (calm down: the beef and shrimp are cooked) and another, "Korean Fantasy," emphasizes the Japanese-Korean fusion with crab, cucumber, and tomago topped with bulgogi, kimchee, crunch, and onion. Another unremarkable interior belies another popular sushi place, and this one is all about the rolls -- salsa rolls with sliced jalapeños, Hawaiian rolls with pineapple, Philly/Boston/Michigan rolls with no readily apparent local connection to the areas for which they are named, and the house special Wow Roll with salmon, cucumber, avocado, egg, and crab with eel, tuna, and masago on top. If you liked baked rolls and saucy rolls and deep-fried rolls, you will like Wow Sushi. If you haven't noticed the trend here, Oakland County is pretty much where you need to go if you want good sushi (good Asian food of any stripe, really). We're rounding this list out with Sushi Den in Walled Lake, a dot of a city built around the actual Walled Lake. Sushi Den is a small Japanese restaurant that serves straightforward sushi and sashimi in addition to more unique items like broiled salmon, mackerel, and saury. They also have rice and noodle (udon, soba, ramen) entrees, katsu dishes (panko-fried chicken and pork cutlets), and bento boxes. Everything at Sushi Den is exceedingly simple, which allows the focus to be on freshness and mastery of execution rather than flash. Nicole Rupersburg is a freelance food and travel writer who still hates the use of the word "authentic" in food writing, regardless of the context. Follow her on IG @eatsdrinksandleaves.